1.2 mm emission map of the GMC G345.5+1.0 (López et al. 2011). The white ellipses represent the two rings of the region: G345.45+1.50 and G345.10+1.35. The area above the red dashed line represents the region studied by the team. Credit: Figueira et al., 2019. An international team of astronomers has conducted multiwavelength observations of the star-forming region G345.5+1.5. The observational campaign discovered dozens of massive stars as well as protostellar and bound starless clumps in the region. The study is presented in a paper published January 30 on arXiv.org. Star-forming regions are essential for astronomers to better understand the processes of star formation and stellar evolution. Observations of such regions have the potential to expand the list of known stars, protostars, young stellar objects and clumps, which could be then be studied comprehensively in various wavelengths in order to get more insights into initial stages of stellar lifecycle. Located most likely some 5,900 light years from the Earth and about 850 light years above the galactic plane, G345.5+1.5 is a star-forming region composed of two dusty ring-like structures (known as G345.45+1.5 and G345.10+1.35) and classified as H II regions. Given that G345.5+1.5 is above the plane of the Milky Way galaxy, it is not covered by most surveys, and therefore needs more dedicated studies. So a group of astronomers led by Miguel Figueira of Laboratory of Astrophysics of Marseille in France conducted submillimeter and molecular observations of G345.5+1.5. For their observational campaign they used the Large Apex BOlometer CAmera (LABOCA), and the NANTEN2 Telescope, as well as data from 2MASS, Hi-GAL and Spitzer-GLIMPSE surveys. "We used the APEX-LABOCA 870 µm and NANTEN2 12CO(4−3) molecular line, complemented with 2MASS, Spitzer, and Herschel Hi-GAL observations, to study the G345.5+1.5 region," the researchers wrote in the paper. The observations identified at least seven late-B and early-O high-mass stars (which could increase to 12), 45 870-µm clumps, 107 12CO clumps, and 79 Hi-GAL sources. According to the paper, the 870-µm clumps have diameter between 1.3 and 3.9 light years, and masses between 43 and 3,923 solar masses. When it comes to 12CO clumps, they are similar in diameter to the 870-µm clumps, but with masses in the range of 28 to 9,433 solar masses. The astronomers noted that more than half of the newly identified clumps are protostellar, and a new generation of stars will emerge from them. Moreover, the boundedness of the protostellar clumps also indicates that most of them will be able to host star formation in the future. 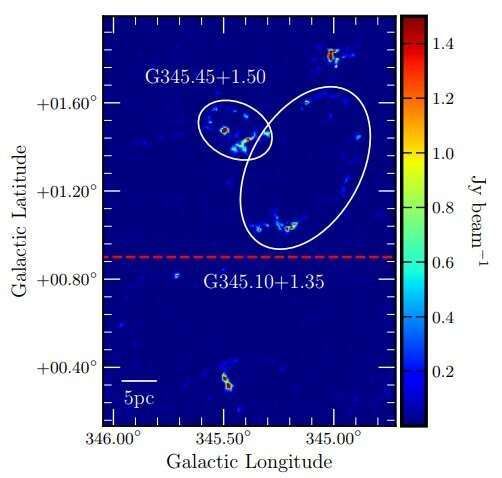 All in all, results of the study confirm that G345.5+1.5 actively forming stars, while its properties, especially star formation rate (SFR) and SFR density (ΣSFR) are comparable to other star-forming regions found within the galactic plane. "This is in agreement with the high percentage of bound 12CO clumps and its SFR and ΣS FR, which are comparable to other well-known star-forming regions of the galaxy," the paper reads. If we manage to last a million years or so, maybe we might see some of these stars form. But it's looking doubtful right now. Meanwhile, the good news is our galaxy is still filled with active star forming regions, indicating that there are still new star systems being created, each one pregnant with the possibility of life. In publications [1-3] a new cosmological paradigm was proposed. The picture of the birth of stars and galaxies resulting from this paradigm was also presented in [4, 5]. In  a hypothesis was proposed about the origin of the jets and outflows from stars and galaxies. A new generation of ground and orbital astronomical instruments rapidly increased the sensitivity and resolution of observations. In this paper, an attempt is made to analyze the latest observations from the point of view of a new paradigm.